With nearly 400 stores across five countries, we're a one-stop source for domestic, international, and freight shipping services. When you visit your local Pak Mail in Covina, we'll find the most cost-effective, safe way to pack and ship your items, whether it's by air, ocean, or ground. Welcome to Pak Mail Covina! 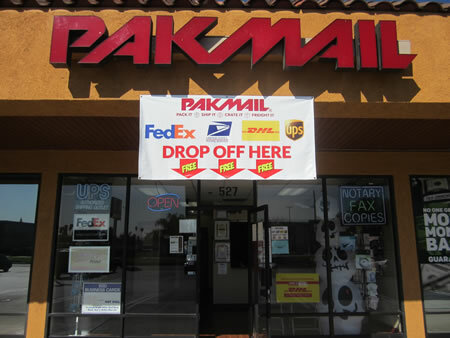 Pakmail Covina located in the Covina Village Shopping center is the ONLY packing and shipping business you will ever need. Unlike other packing and shipping stores, we offer to ship whatever you need, however you need it shipped with all major carriers, including UPS, FedEx, DHL, USPS, Freight (Road, Ocean and Air). So, we are NOT a BASIC SHIPPING Store, we are PAK MAIL. Plus we offer custom crating and pick up service. Who else does that? You've come to the right place! We promise you fast service, and a courteous staff that are eager to help you discover just how much time and money we can save you. We respect your time by offering efficient and expert personnel as your one-stop source for all your shipping and business needs.